Rose Tascher leaves her family and the life she has known behind in Martinique when she sails to France to marry. But her dreams of romance in Paris are shattered by her husband Alexandre, who cheats on her and ultimately leaves her. She must find a way to support herself and her two children and survive the French Revolution. Rose catches the eye of an up-and-coming general and soon finds that she is Josephine, symbol of luck and prosperity and the wife of the powerful and unpredictable Napoleon Bonaparte. Josephine lives through a fascinating and frightening time period. We see her reinvent herself over and over again, as a lover, as a wife, as a mother, as a symbol to the people of France. Her story reminds modern readers just how dangerous it was to be a woman in the 18th century. Josephine is forced into marriage not once, but twice. A woman will be divorced and lose her reputation forever if she is unfaithful, but a man of high status is expected to be involved with several women. If her husband or father do not support her, it is virtually impossible for her to survive or care for her children. Heather Webb has created a wonderful glimpse into the life of one of history's most fascinating women. But choosing to cover thirty years in only 300 pages means that things often feel rushed and fragmented. There are actually sections where the narrative breaks on one page and then breaks again on the next, giving us snippet after snippet. We get to spend only a little time with Alexandre, Napoleon, or Josephine's family, so it is hard to feel anything for their triumphs and defeats. I understand that Josephine's life may have been exactly like this series of starts and stops that are portrayed in this book - waiting for her husband to return, playing the part of the devoted spouse, taking part in a huge fight, and then waiting for said husband to return again. But it isn't that interesting to read, especially when we cannot understand the rationale of the other half of the couple. 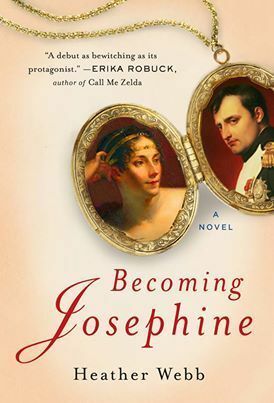 Becoming Josephine serves as a great introduction to Josephine. We see a young woman become a wife and a mother and find her own will and voice in a world that was not kind to women. While I wish this book had been longer and more in-depth, it is a perfect place to start if you want to learn about Empress Josephine. Wondering what other readers thought about Becoming Josephine? Visit TLC Book Tours and check out more reviews! Sounds like it could be an interesting topic but more info and action was needed to flesh out the story, especially because this is based on a real person. Thanks for an honest review. It was one of those cases when I wanted a book to be longer! I was interested in what was happening but it was just so hard to connect with anyone or anything because it was constantly moving. There was so much packed into Josephine's life! This book looks to be a great overview. It's too bad this wasn't longer, but it sounds fascinating! I love reading about women in history. It's Monday and I need a nap! It's Monday - what a crazy week!